As of June 2018, nationals of all countries are eligible for an Ethiopian online visa (e-Visa). By applying, travelers do not have to visit the consulate to apply for a tourist e-visa. You can submit all the required documents, information and pay for visa fees online. This streamlined system cut out the time wasted waiting in lines and costly processes that were previously in place. The Ethiopia Tourist e-Visa is an official document issued electronically by the Main Department of Immigration and Nationality Affairs. Applicants will receive their visas via email, after filling out the application form with the necessary information and once the online credit card payment is completed. Passport with at least 6 month validity from the date you intend to enter Ethiopia. A recent passport size digital photo. A scanned copy of passport bio page. Credit/Debit card or Paypal account for payment. The validity of an Ethiopian e-Visa starts from the date you intend to enter Ethiopia, not from the date of issue. You need to have a passport with at least 6 month validity from the date you intend to enter Ethiopia. Super rush processing times for Ethiopia e-Visas are approximately 24 hours. 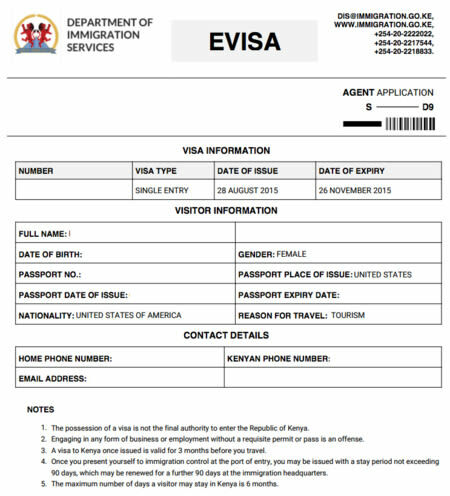 Travelers who apply for a tourist visa must have their travel document/passport/residence permit valid for at least six months from the planned date of entry. Applicants who claim that they have a permanent residence permit in one of the eligible countries must upload the valid residence permit document. The e-Visa takes 1 business day, but please note that delays may occur for up to 3 days so we suggest that you apply 3 days prior to your trip to Ethiopia. The e-Visa is for tourism and family visits to Ethiopia only (no work allowed). You can use this type of visa ONLY if you plan to arrive by airplane to Addis Ababa Bole International Airport (at this stage it is not valid at any other border posts). IMPORTANT: If you apply from a country other than the country of your nationality, then you will be required to show the residence permit when you arrive in Ethiopia – this can be a letter or visa sticker in your passport. What is an Ethiopian e-Visa? It’s an official document which provides authorization to travel to and from Ethiopia. It is electronically linked to your passport. What do I need to apply for an Ethiopia e-Visa? How much is the cost of the Ethiopia e-Visa? The cost for the 30 day e-Visa is 52 USD, and for the 90-day e-Visa 72 USD. Additionally, there is a service fee of 35 USD for standard processing. For rush and super rush processing, the service fee is 65 USD and 100 USD respectively, for both visa types. How long does it take to process an Ethiopian e-Visa? Standard Processing: 3 business days. Super Rush Processing: 1 business day. How long is the e-Visa valid for? Unlike many other visas that start their validity from the date they’re issued, the Ethiopian e-Visa's validity starts from when you intend to enter the country. So your e-Visa will be valid for 30 or 90 days from your intended arrival date in Ethiopia, depending on the e-Visa type you choose. NOTE: The validity period is different from the duration of stay, which is 30 or 90 days. Duration of stay CANNOT exceed the validity period of the visa. For example, if you change your plans after the visa is issued and your arrival date is 10 days later than what is on the e-Visa, your validity is 20 or 80 days. Thus, the maximum duration of your stay is 20 or 80 days. NOTE: The validity period is different than the duration of stay which is 30 or 90 days. Duration of stay CANNOT exceed the validity period of the visa. For example, if you change your plans after the visa is issued and your arrival date is 10 days later than what is on the e-Visa, your validity is 20 or 80 days. Thus, the maximum duration of your stay is 20 or 80 days. How long should my passport be valid for if I want to apply for the Ethiopia e-Visa online? Your passport must be valid for at least 6 months from the date you intend to arrive in Ethiopia. How many entries come with the e-Visa to Ethiopia? One, its a single entry visa. How will I receive my e-Visa once it's issued? The visa will be sent to you by email in PDF format. You need to print this document and take it with you when you travel. Who is eligible for Ethiopian e-Visa? Nationals of all countries are eligible for the Ethiopian e-Visa, effective June 1, 2018. Can I get a multiple entry visa online? No. At the moment, only single-entry tourist visas can be issued online. What happens if I travel with children? If traveling with children, make sure you are in possession of a valid birth certificate and/or adoption certificate, as appropriate, to avoid last-minute inconvenience. Keep in mind that the rules are valid for all children whether they are biological, adopted or just traveling together. I will ONLY be in transit (not leaving the airport) in Ethiopia, do I still need to apply for the visa? No, you do not require an e-Visa for transit flights/layovers in Ethiopia. If you want to leave the airport transit area to visit Addis Ababa then you will need to apply for a 30-day single entry visa online, or visit your nearest Ethiopian Embassy to get an in-transit visa through them. Can I enter anywhere with this e-Visa for tourism or only at certain places/border posts? Currently, the Ethiopian Government only allows travelers with this Tourist e-Visa to enter via the Addis Ababa Bole International Airport. Entry via other ports of entry is not allowed. Ethiopia started to gain its popularity in the recent years. People did not use to travel there are often as they do now, but it is an affordable destination. Plus, you get to experience a lot of things, even if the country does not have a significant surface area. Besides, Ethiopia is rather different from other African countries, and I am sure you will find a lot of things there that will catch your eye. You will create a lot of beautiful memories, and people there are very welcoming. Even so, there are probably some things that are best to be known before you actually get there. You will find some of them below. First things first, only the people from Kenya can travel to Ethiopia without a visa. Even so, getting one should be easy since you can get it online. It is not very expensive, and the process is fairly simple. You can travel both by land and by air. At the same time, you can get a visa on arrival when you arrive at the Addis Ababa Bole Airport. Leaving documentation aside, there is a ton of other things that you need to know before traveling to Ethiopia. For one thing, you should be aware of the fact that people from Ethiopia are very relaxed. They treasure their rest, which is why you will not find some places open during lunch. So, if you want to use some services, like a bank for example, between 12 and 2 PM, you cannot. That is because most places close down during that time. It is some sort of Spanish siesta. Everyone needs to eat and rest in the middle of the day so that they can continue working until the end of the program. The weirdest aspect you will encounter in Ethiopia is how people there keep time. They have their own system that may throw you off. Out 6 o’clock is their 12 o’clock, and that is when they start their day. This should be of no importance to you, but when you have something scheduled, you need to ask what time they are referring to. Ethiopian time or international time. It goes the same with the dates. Ethiopia uses the Julian calendar so it will take a while until you get the hang of it. Many people think that African countries are dangerous, especially when you are traveling alone. While that is true in some cases, it does not apply to Ethiopia. In fact, you can travel alone as a female and still be safe, even in Addis Ababa. You do not have to fear thieves, kidnappers, or anything else of this sort. People there are peaceful, and since the tourism has developed in the last few years, they are welcoming. If you want to go exploring in Ethiopia, it would be best if you hire a guide. Ethiopia has an interesting history, and some of the facts are less known than others. That is why a guide is necessary. At the same time, you cannot even explore some of the parts of Ethiopia, such as the Danakil Depression, Simien Mountains, and Omo Valley, without a guide. Rest assured that most of the guides speak excellent English, but you should refrain yourself from making the payment before you know that for sure. You do not want to get stuck in the middle of nowhere with someone that does not know how to communicate with you, do you? While Ethiopia is an affordable destination, I am sure that you think it is incredibly cheap. However, that is not entirely true. In fact, it can get quite costly, mostly because you need guides. Also, accommodation can be a bit pricey. The tourism tax is a common thing, so consider that before you go there. Even so, I am sure you will find cheap are the food and drinks. You will be amazed at how much you can eat and drink at the price of a meal in a western country. As for the preparations before your trip, it depends on where you come from. For example, if you are a US citizen, you need a European adapter for your devices. In Ethiopia, they use 2-pin plugs. When it comes to clothing, make sure that you pack some thick clothing for the chilly nights. Ethiopia is located at a pretty high altitude, and it can get pretty cold during the night. Some fluffy socks, sweaters, and long pants should not be missing from your luggage. At the same time, Ethiopia is an excellent place for hiking, which means that you need some hiking gear as well. Do not forget your boots and your pants before you leave. Among the things you take with you should be toilet paper. You will almost never find any in public restrooms, and sometimes even hotels lack TP. You should probably pack a few rolls so that you do not find yourself without. Leaving practical things aside, you should know that Ethiopia is a very photogenic country. You should never leave home without your camera. A lot of people choose Ethiopia for its scenery, and you cannot possibly go there without snapping a lot of photos. The view is breathtaking in the mountains, and I am sure you will regret forgetting your camera as long as you live. It may not be so important for some of you, but you will want to go over your trip again and again. A lot of pictures will help you with that. They will keep the memories alive for longer. Overall, Ethiopia is a lovely place to visit. The people are friendly, the food is good, and you have to taste their coffee. They are actually famous for their coffee. Plus, the scenery is mesmerizing, and you will have goosebumps whenever you take a look at the mountains, valleys, or whatever place you choose to visit. Ethiopia is full of wonders, and you should take advantage of your time there by exploring as much as your time allows you.